Adipic acid is one of the most important of the commercially available aliphatic dicarboxylic acids. More than half of the adipic acid production capacity is derived from cyclohexane, with the remainder mainly from cyclohexene and uncoupled cyclohexanol/cyclohexanone (KA oil), although a small amount is still made from phenol. The major markets for adipic acid are in use as a feedstock for nylon 66 resin and fiber production; the remainder is consumed in nonnylon applications, including polyurethanes, plasticizers, food additives, and pharmaceuticals. Use in the production of nylon polymers as well as polyester polyols, which are used in hot-melt adhesives for shoe soles and other products, continues to grow swiftly. Nylon 66 industrial filament will be the fastest-growing market for adipic acid in the forecast period, driven by growth in China. Nylon 66 fibers and engineering resins accounted for approximately 57% of total adipic acid consumption in 2016, although nylon 66 chip is a much larger market for adipic acid. Steady automobile and electronic manufacturing will be the basis for continued demand growth in nylon resins, while economic recovery and superior processability and performance will contribute to fiber consumption. Of the 43% consumed in nonnylon applications, around 5–10% was in food additives, 8–12% in polyurethanes, 5–8% in plasticizers, and 10–12% in other miscellaneous applications such as fillers, paper additives, cosmetics, polyester molding agents, lubricants, and other chemical intermediates. 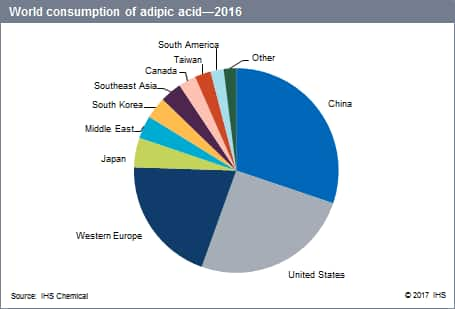 Asia drives the global adipic acid market, with 45–55% of global capacity, production, and consumption in 2016; total regional consumption is forecast to increase at an average of 4.7% per year in 2016–21. Consumption in North America, Japan, and Western Europe will stagnate at the current levels or even decline slightly. The North American market is saturated; the United States represents more than 89% of total regional consumption, with a slight decline anticipated in the next five years. Consumption in the Middle East is expected to increase at an average annual rate of 4.6%; this growth will be driven by new nylon 66 chip/resin and fiber end uses. In terms of magnitude and growth, China leads the pack; in the last five years, China has become the main driver for adipic acid production and consumption. In 2016, China accounted for nearly half of total global capacity, 40% of global production, and 30% of global consumption, with estimated consumption growth averaging about 6% per year in 2016–21. In addition, China accounted for more than half of the global export market, displacing exports from the traditional sources—the United States and Western Europe; this led to capacity rationalization in the United States in late 2015. China is the only country planning to add capacity during the forecast period. In the next five years, world consumption is expected to slow to an average rate of 2.2% per year.